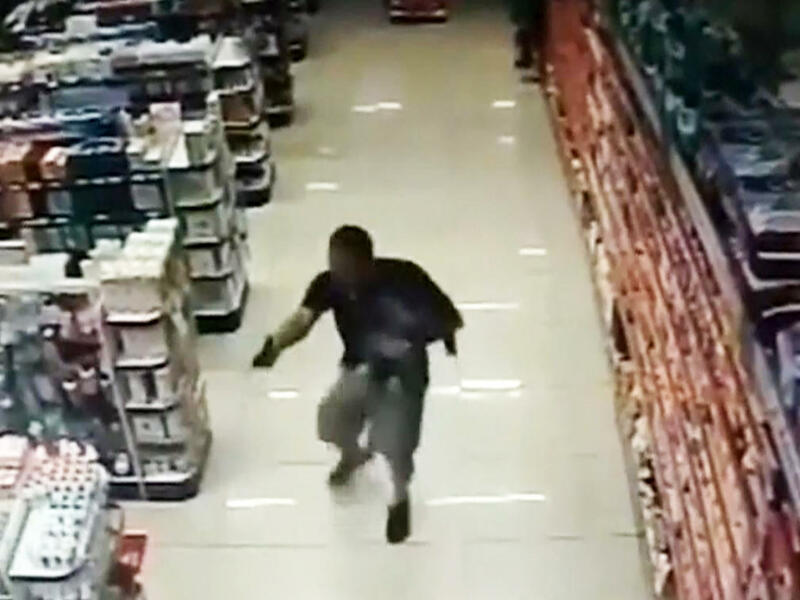 An off-duty military police officer's trip to the pharmacy with his family turned into a deadly shootout in Brazil over the weekend. Sgt. Rafael Souza went to buy medicine with his wife and young son late Saturday afternoon when two armed, hooded men stormed the business outside Sao Paulo, Britain's Independent newspaper reported, citing a Brazilian radio station. One of the men pointed a gun at Souza, who drew his own weapon, the Independent reported. Surveillance video shows Souza holding his son with one arm and his gun with the other. Souza was seen firing his weapon behind the back of a man who had his hands raised. He then checks the other end of the store before turning his attention back to where he was firing. While continuing to hold the child in his arm, he runs and fires his gun again, disappearing out of frame. Souza's wife then comes into the view of the camera and was seen crouching in an aisle. She extends her arms toward her husband, who hands off their son and continues his pursuit. The two suspects, aged 24 and 22, were pronounced dead at the scene, the Independent reported.